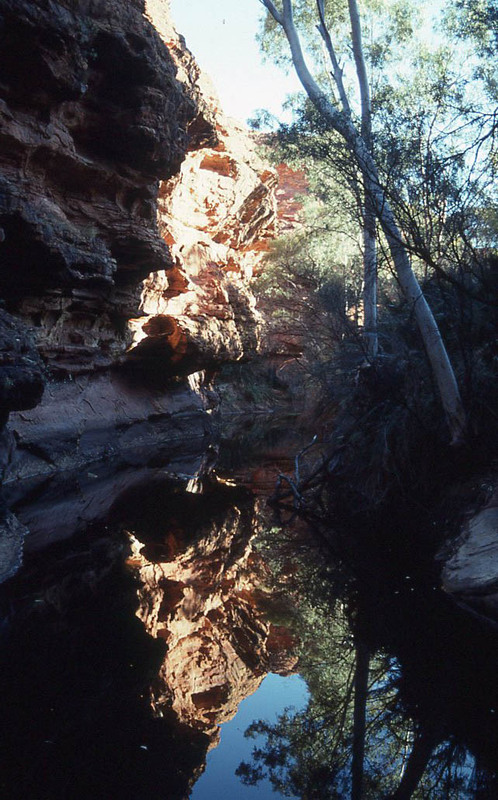 Once known as Kings Canyon, Watarrka National Park is a must-visit while you’re touring the Red Centre. It’s accessible by either 2WD or 4WD depending on which road you take. 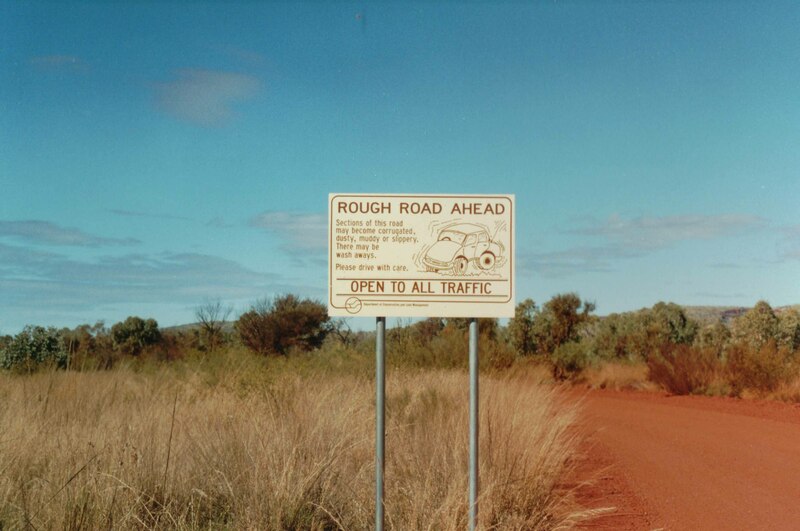 When we visited nearly 20 years ago it was a rather bumpy corrugated road but the Holden survived it happily, though our teeth had more of a challenge! This said it all. Oops, I think this might be actually Karrajini NP in WA but you get the drift. 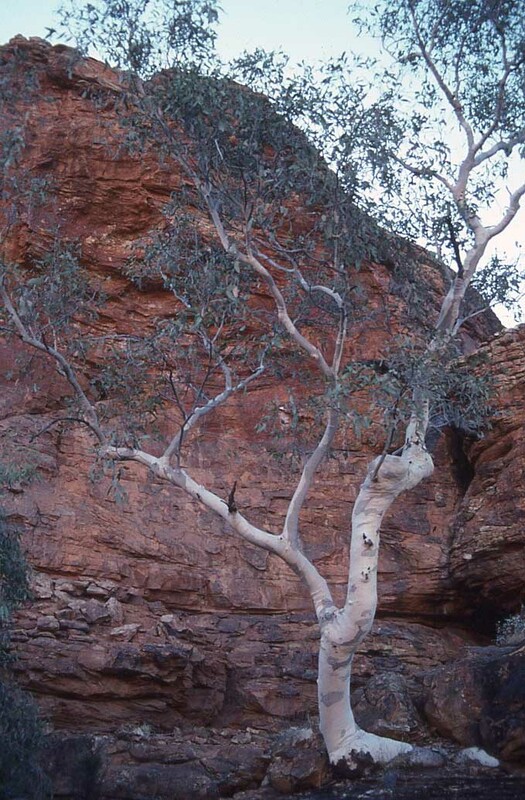 Watarrka continues the sub-theme of this challenge which appears to have been geological formations, as it seems I could have done almost a whole A to Z on “rocks and gorges I have known”. 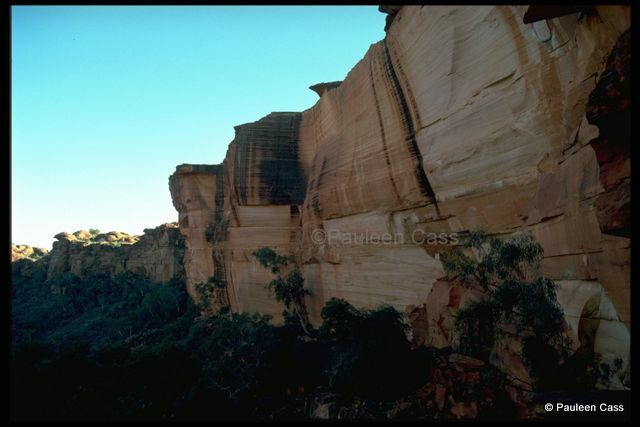 For me what’s different about Watarrka is the colour of the Canyon rocks, a sort of dusty pink with splashes of cream, and the sheer cliff face. The Canyon walk can be both tedious and a bit daunting depending on your fitness or anxiety about cliff edges (one of my own phobias). However if possible it’s well worth the effort, but do plan to start out your walk early in the morning before the heat of the day kicks in. You can also go with a tour guide, for not much expense as I recall, but ours moved with a bit too much speed –it would have been nice to meander a little more. At the foot of the rocks there are once again, hidden nooks, crannies and water holes which support a diversity of life and form a mini ecosystem. 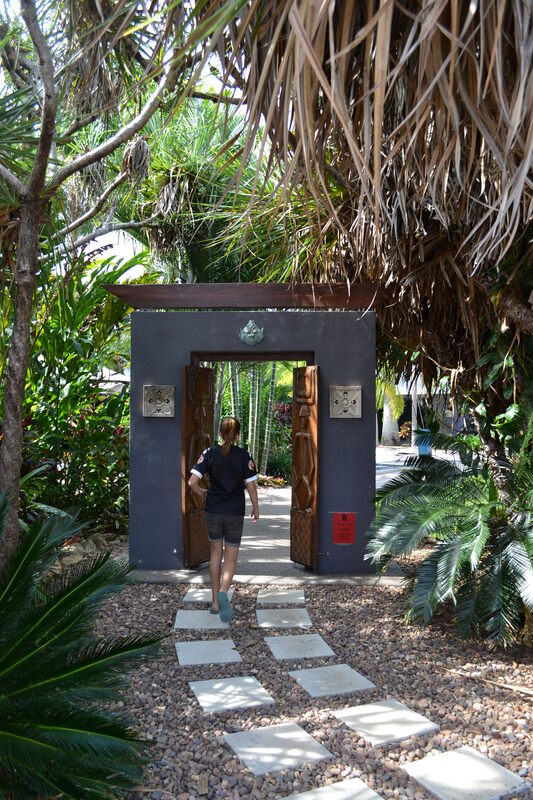 These low-level walks are accessible to the less fit or those who have walking challenges. Shaded nooks and waterholes provide sustenance for desert creatures. I notice on the park’s website they feel the need to tell people: Watarrka, as with all National Parks is a protected area. Disturbance of plants, animals and natural features is an offence. It is prohibited to: break branches for fly swats; write or etch names on rocks; remove or displace the natural landscape i.e. rocks or flora. Cigarette butts, tissue paper and orange peel are three common and unsightly forms of litter. I’m always amazed by the hardiness of some of our native trees. I’d have thought that would be self-evident, “take nothing but photographs, leave nothing but footprints” but obviously the park rangers’ experience suggests that many people still don’t get it. Also don’t forget to slip on your shirt, slop on some suncream, slap on a hat, and carry some water! Why visit: To enjoy another magical place in the desert and see some quite different rock formations and a canyon (but not on the scale of the Grand Canyon). Join me tomorrow for some culture of a different sort. 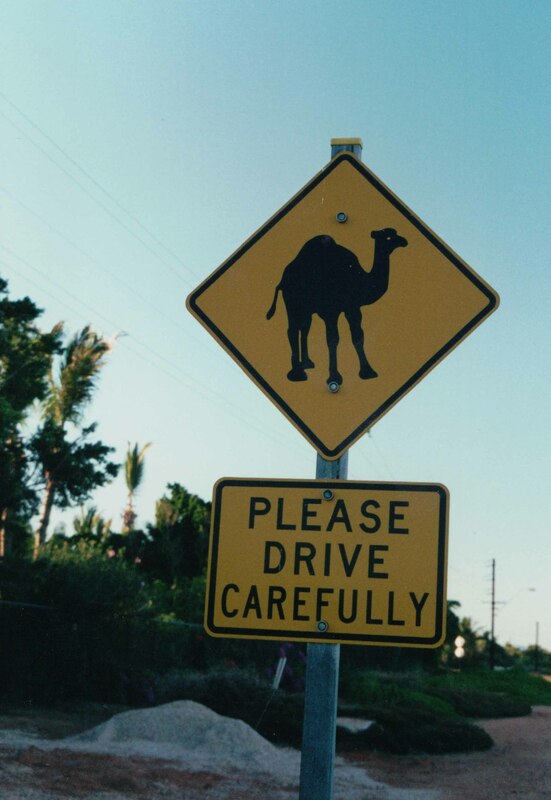 Camels were brought into the desert by the Afghan traders of the 19th century. Won’t have a bar of it: won’t touch it. Waddya: Aussies have a common habit of slurring or abbreviating words. 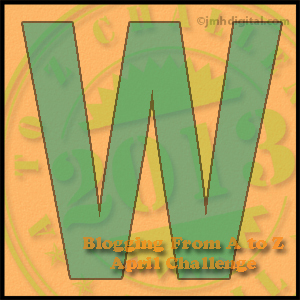 What do you….waddya…..
Wig wam for a goose’s bridle: my mother used to say this all the time. In essence it means mind your own business. Weak as cat’s piss: a pathetic person with no commitment, or an argument that doesn’t hold up to logic etc. Waffle: not the food that people have with ice cream and honey or maple syrup but meaning “talks vaguely on, and on about nothing of importance”. Wog: an Australian name from the post-war migration when there was a significant influx of Mediterranean immigrants. Sometimes meant as an insult, but not always, but perhaps that depends on whether you’re on the receiving end. Wuss: cowardly or timid person, much the same as “chicken”. A minor insult intended to suggest, quite often, that someone is “a bit of a girl”. 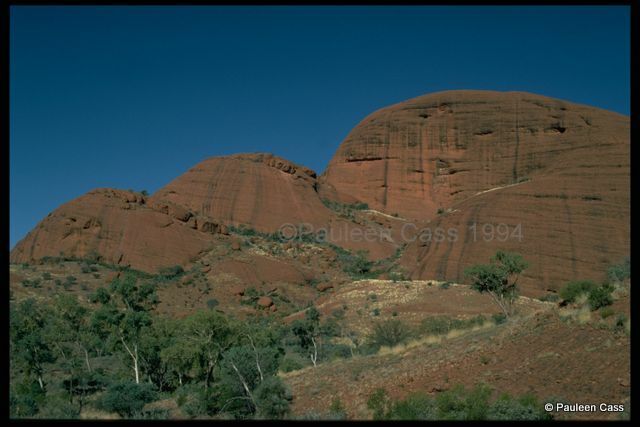 The Olgas or Kata Tjuta, as this rock formation is now known, is part of the Uluru- Kata Tjuta National Park. Kata Tjuta’s more famous big sister tends to take the highest profile but if you’re heading for the Red Centre you should allow time to do both parts of the park. This national park is truly Australia’s red heart and is smack bang in the middle of the country and probably encapsulates the sense of the Outback more than anywhere else. 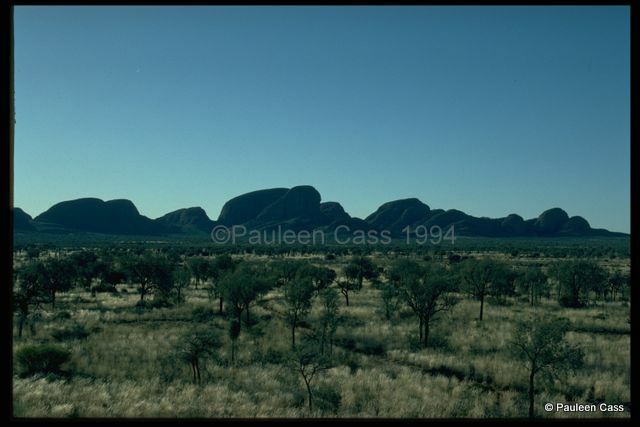 Kata Tjuta is all curves as each rocky dune looms against the vivid blue of the desert sky. The contrasting colours are magnificent with the green of the Spinifex looking almost lime-coloured on film and in some light. It provides its own dot-painting effect against the vivid ochre red of the rock formation. Tucked among the rocks are hidden spots where the desert animals can live, survive and even thrive. A quiet bushwalker has the benefit of hearing the birds and may even see some creatures as well. The track through the Valley of the Winds is peaceful and restorative, as well as tiring! This is certainly an experience best savoured in the cooler months of the year when overnight it can be decidedly chilly, especially in a tent or swag. Those hot summer months (about October to April) are best avoided as most people will find them unbearable. 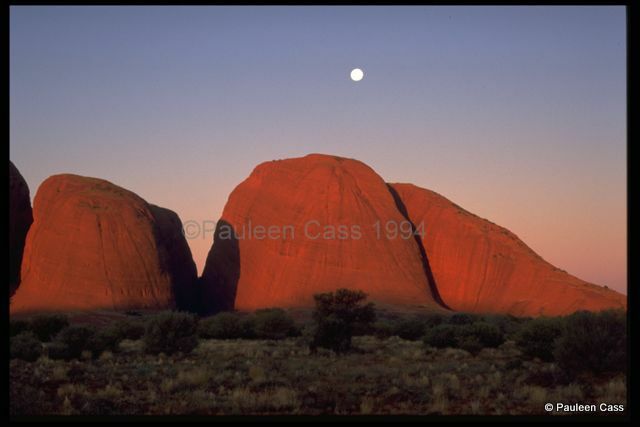 Do plan to hang around at the Olgas towards the end of the day so you can see the setting sun light the dunes with varying shades of pink and red. Just magnificent! If you love gardens it’s always worth keeping an eye out for the local Open Gardens events when you travel – they’re a great Opportunity to see new and different garden designs as well as plants you may not be familiar with. 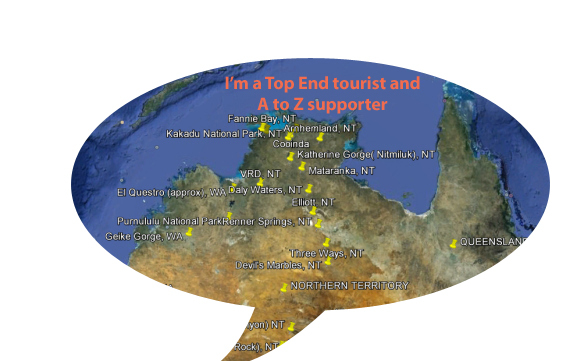 The 2013 season Open Gardens NT commenced last weekend and we have a feast of Top End gardens to choose from throughout the Dry. It’s one of our favourite weekend activities to visit a garden and have a coffee and cake while soaking up the ambience. You can see my stories and photos from 2012 through this link. 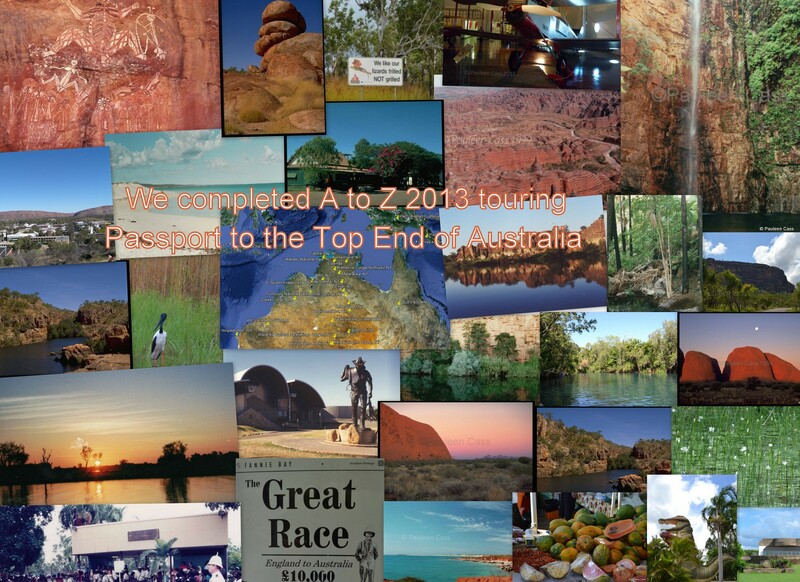 Why visit: To see a unique natural wonder of Australia and the amazing colours, vegetation and animals of the Outback. Old mate: A NT special gradually soaking into the vernacular elsewhere. A generic expression meaning, roughly, bloke, someone you don’t know. So old mate drove his (Land) Cruiser through the creek…. 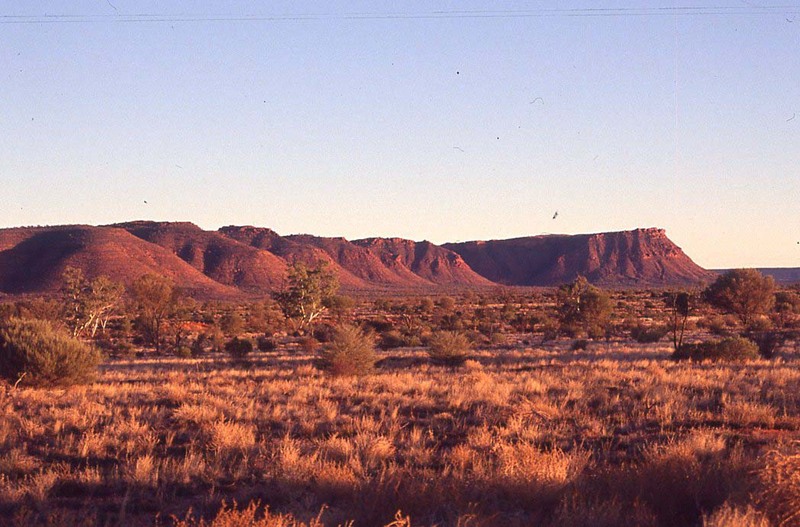 Outback: Australia’s vast interior. The iconic idea of Australia often completely unfamiliar to its many coastal dwellers. The people are typically unemotional and physically tough and laconic. I wonder where the letter P will take us tomorrow? How about back into the Kimberley?